The quintessential green garden scent. Burning time - 45 to 50 hours. Produced by Cire Trudon candles in France. Carrière Frères was awarded a gold medal at the 1889 Universal Exposition and became the official wax supplier to the Basilica of Sacré-Coeur in Paris. Carrière Frères candles feature a unique wax formula that allows for a clean and even burn. 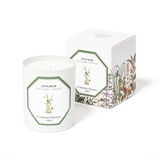 Carrière Frères candles are now expertly produced by Cire Trudon in France.